Today I'd like to introduce two absolute MUST HAVE for airbrush muas, and two of my favourite makeup complements in general. We all know that one of the best advantages of airbrush makeup is its amazing durability, however there are times and occasions when we may need to "seal the deal" against unforeseen factors such as tears, unusual perspiration or even simply weather. Weddings, stage and screen appearances or even a simple night at the club will require a little extra guarantee to make sure the makeup stays flawless until you decide to take it off. 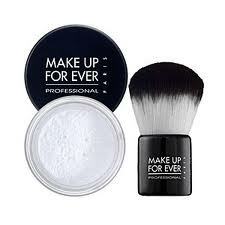 This is where these two amazing products by makeupforever come in. HD Microfinish Powder is a clear, ultra fine finishing powder featuring a proprietary pigment called "soft focus" that is created to do just that: give your overall makeup the same effect as you would get applying a light soft focus filter to your camera, without smudging or interfering with the colours you chose in any other way. The final effect is very subtle, but if you use professional lights you will immediately appreciate the difference, and you'll love it even more when you see the results on camera. HD powder is applied with an amazing Kabuki brush made of the finest, softest synthetic polymer imaginable, creating a soft, luxurios and above all shed-free experience. It is pretty much the only brush I actually use since I "converted" to airbrush makeup! After you've applied HD powder it's time to seal your makeup for good. 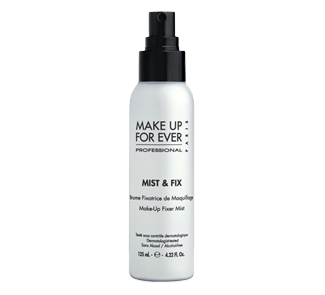 Mist & Fix is the perfect product to achieve just that. As the name suggests, it is a spray on mist that is applied without any propellant. This is somewhat scary at the beginning, especially if you are wearing waterbased makeup, because the product is atomized somewhat unevenly from the bottle, producing droplets that vary in size and that will appear to leave a mark when they land on your face, but please don't panic, it will dry without a trace in under a minute, and you'll be ready to face your day without fearing sweat, tears or weather.